Satin-finish stainless steel unit and dispensing mechanism. Door has face with protruding tumbler lock. 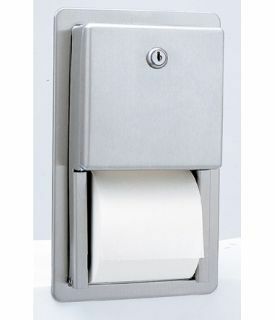 Holds two rolls up to 5 1/4 inchdiameter (1800 sheets). Extra roll drops in place when bottom roll is depleted. Theft-resistant, heavy-duty spindles. Extends 2 3/4 inch from wall.